Rhinophyma is considered as one manifestation or complication of rosacea. It is more frequent and more severe in males and may be the only manifestation of the disease as in this old man who presented with bulbous hypertrophied nose of more than two years duration. This 20-year old male suddenly developed monomorphous papulopustular rash mainly on the trunk, shoulders and less on the face. Comedones were absent. He gave a history of taking an appetizer (a mixture preparation containing steroid, cyproheptadine and some tonics to stimulate appetite and to increase body weight) 3 weeks prior to the onset of rash. For the rash a medical sub-staff has prescribed an injectable steroid for the patient which caused further exacerbation of the rash. This scenario is encountered repeatedly during dermatological daily practice. Steroid acne is a folliculitis caused by the use of systemic and/or topical corticosteroids. Although other medications have been implicated in acneiform eruptions, steroid acne results in a distinctive clinical picture characterized by the sudden appearance of monomorphous papulopustules predominantly on the upper truck and arms, but also on the face. Comedones are not apparent. A 32-year-old male suffered more than 5 years history of folliculitis that progressed to keloid formation involved the nape of the neck. It was not associated with other acne lesions elsewhere in the body. 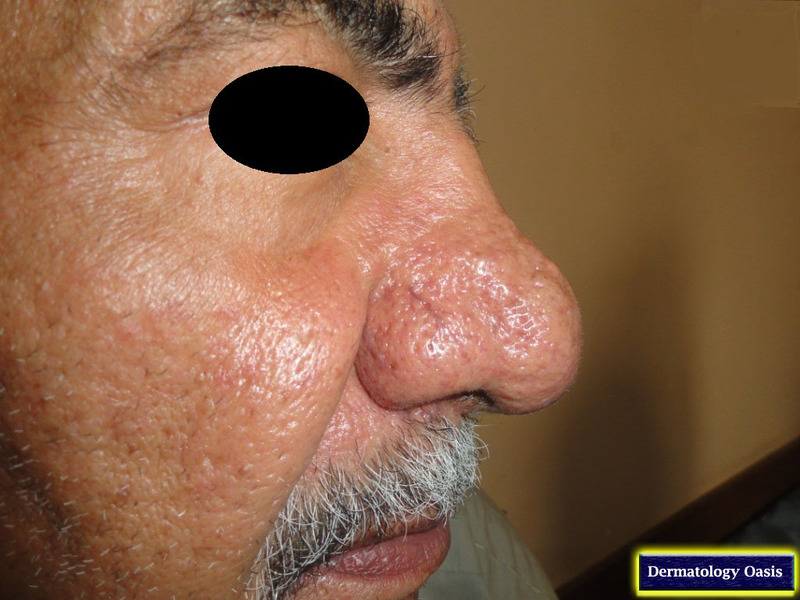 A 83-year-old man presented with thickening and wrinkling of the facial skin and numerous black-head comedones on the nose and less on the lateral sides of the face. The nose was studded with yellowish follicular papules and cysts in addition to the comedones. A 20-year-old male suffered severe nodulocystic acne involved most of his face of three years duration. Many lesions have ended with pitted and atrophic scars. 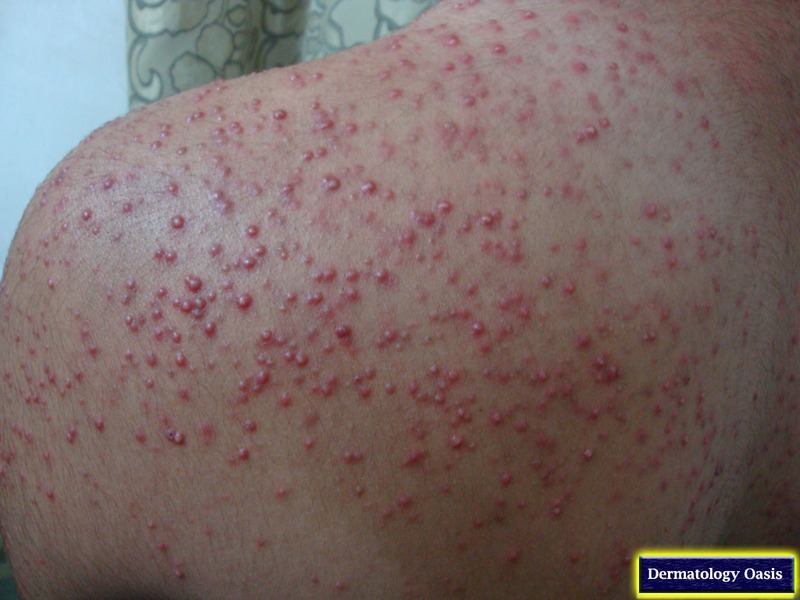 A 20-year-old male presented with a polymorphic rash composed of inflammatory follicular papules, pustules, abscesses, nodules and cysts involved mainly the trunk of more than one year duration. Negative history of corticosteroids or other drugs. Topical and systemic antibiotics gave modest results, however shifting the patient to isotretinoin resulted in prompt and dramatic response. A 68-year-old man presented with a hypertophied, red nose with prominent pilosebacous openings of more than 10 years duration. He was disappointed by poor response to many medical conservative therapies used for long periods. A teenager male presented with severe nodulocystic acne of more than one year duration. Although the lesions were few in number but they were so large in size resulted in abscess formation specially on the forehead.